I’ve written in the past about Saturday mornings and a ritual that included a reflective walk to Starbucks to consume some caffeine and the newest issue of Barron’s for the week. It was early in my discovery of long-term investing … an exploration that led to the formation of a family and friends investment club back in Wheaton, Illinois in the early 1990s. 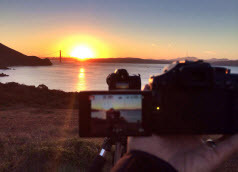 It was those early morning jaunts where I began to discover the nuts and bolts of investing. And frankly, like many who take the leap of faith, it became clear that there was a whole lot of available information. There was a whole lot of “experts” who seemed to spew advice and tips with little or no effort to gauge the effectiveness of their talking head sessions. Into this cloud of confusion and chaos, enter one George Nicholson, Jr. CFA and this campaign we’ve come to regard as the modern investment club movement. Mr. Nicholson is thought of by many as the grandfather of the investment club “grand experiment” … evolving from Detroit in 1941 to a national/global learning experience. We learn that long-term investing is possible and that the odds of success can be dramatically increased by patiently focusing on a few key pieces of information. Add the discipline of developing and sticking to a routine — the core attribute of investment clubs — and it can be like going to battle versus Rommel with Patton in your pocket. So every week we update 1/13th of all the stocks we cover at Manifest Investing. That update includes a vigilant check on three basic components … growth characteristics, profitability trends and P/E considerations including life cycle and company quality. Every week is a snapshot … and you’re invited to take this walk with us. Every week, we’ll take a look at some specific companies. We’re more likely to pay more attention to the most widely-followed companies that command the attention and intention of our community of like-minded long-term investors. Because it makes sense to do so. At the same time, we’re vigilant for promising opportunity and future leaders. I was updating some macro market barometers recently and was reminded — fairly powerfully — of one of the major tenets of the philosophy we embrace and implement. I am referring to the urgency of all-of-the-above investing … maintaining a sufficient balance of small, medium and larger companies with an overall growth forecast that is suitably high enough. We seek a blend with an overall average growth forecast of 10-12%. As an investor, you CAN’T do this without blending in some promising smaller companies along the way. Can You Spot The Difference? And another look … same chart. What’s different? The top chart provides a comparison in the background with the S&P 500 (SPX) … a collection of large companies. The bottom chart provides a similar comparison using the Value Line Arithmetic Average ($VLE) index … an equally weighted construction of small, medium and large companies. This all-of-the-above blend delivers more growth — a characteristic that Nicholson and David L. Babson regarded as a self-correcting mechanism, and opportunity for long-term investors. The 20-year annualized return for the S&P 500 (VFINX) is 9.1%. 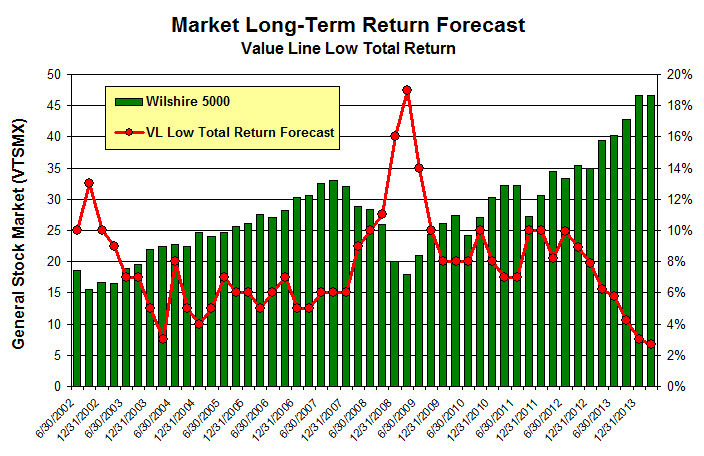 The 20-year annualized return for the Value Line 1700 ($VLE) is 12.0%. The difference, from a long-term perspective, is MASSIVE. The median Value Line low total return forecast is 2.7%, down from 2.8% last week. This indicator has ranged from low single digits to approximately 20%. The relatively low levels suggest/urge more caution and selectivity — particularly with respect to quality. Lower quality stocks are generally punished the most during corrections and recessions. We repeat that stocks, sectors and markets can remain overbought (RSI > 70) for extended periods. But price momentum (ROC) still persists. Morningstar: Market Fair Value. What does it mean? Is the market cheap or expensive? The chart above tells the story based on Morningstar’s fair value estimates for individual stock. The graph shows the ratio price to fair value for the median stock in the selected coverage universe over time. Same chart as the Introduction. Bottom line: the important aspect is the 12-month trailing trend near long-term highs. 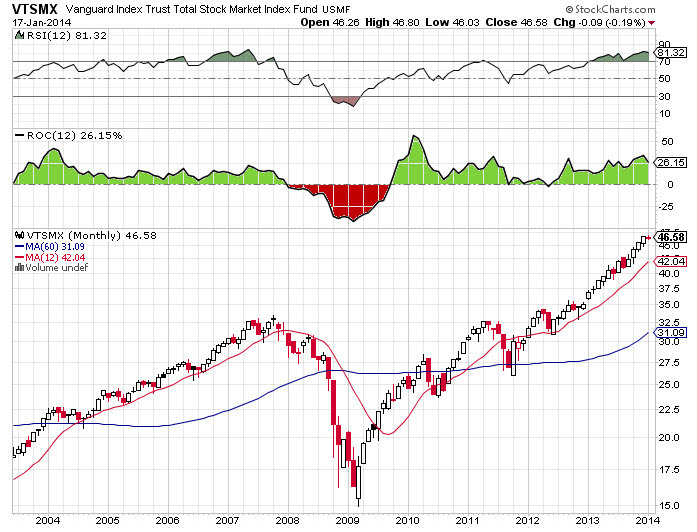 Low interest rates, QE, sideline cash, and retirement plan injections are probably supporting demand for stocks.